Cool! Thanks for showing how you did it! Looks great! This is an amazing quilt! You have an amazing talent! Gorgeous! I had tried to figure how you had accomplished this. Thanks for showing us. Wow. I love it! Thanks for sharing how you did it. That quilt is spectacular. Thank you so much for sharing how you accomplished such an amazing finish.Love it. Stunning quilt both in materials and quilting. I appreciate that you share your techniques. Thank You. Thanks for sharing your process! Very informative. Fabulous job. Always wonder if this would work on a domestic. Freaking Love IT!! The HMQS is coming to SLC in just a little bit of time and I can't wait to load up on circle rulers and all kinds of goodies. Thank you so much for sharing. This looks awesome and it seems doable with your demo. You have a great ideas for quilting! Thank you for sharing! Thanks for sharing how you did this. I love how it turned out! Using negative space as it's own special canvas is such an art, and you excel at it. Thanks for sharing your process, it is very enlightening. This quilt turn out just beautiful! This is absolutely gorgeous! Love how you have creatively used the circles with fillers--very inspiring! And thank you for explaining how it's put together. Beautiful, thanks for sharing how you did it also! Absolutely stunning! Thanks for the how-to. Thanks a lot for showing how you use circle rulers. Great tutorial and wonderful stitching. 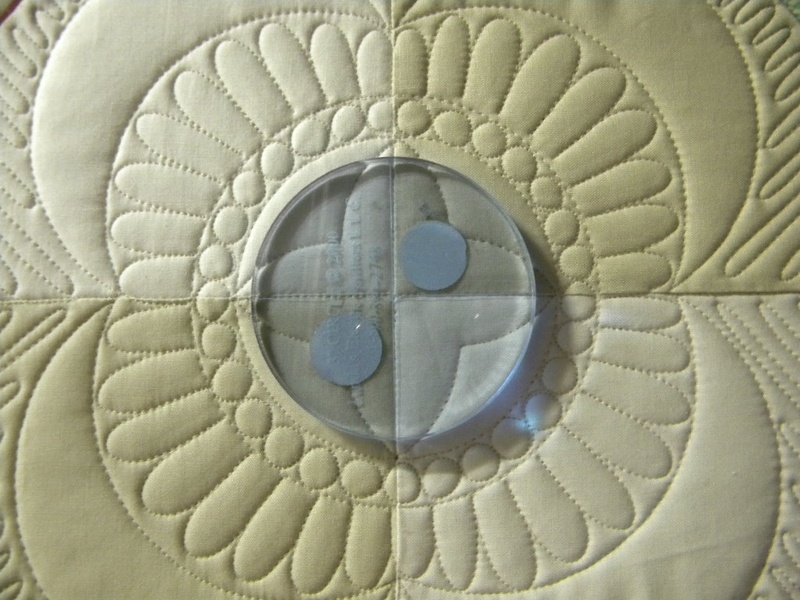 As always, absolutely amazing quilting Jen! Just love it and of course you have now filled my head with ideas! Ugh!!! For those of us just learning and trying...what sizes are small, medium and large for your circles? I'm doing okay with arches, but have no clue on what sizes to order for circles! M.
really nice. I'm gonna go try that on the next quilt! Thanks. Now go get some sleep. Beautiful work! I love how it transforms the quilt. If you'd be so kind, I'd love to have pictures of this quilt on my site to share with my visitors. If you will be offering it as a pattern, do include the links where people can buy it and I'll make those links live once I approve the page. Just beautiful work...thanks for sharing! Thanks for sharing how you did such an intricate design. Your method makes it seem so simple. I love that you share your process. 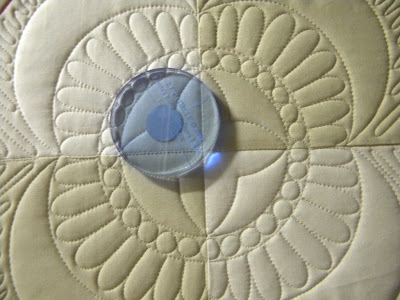 Seeing the finished quilting, it's so hard for me to envision how you were able to create these complex designs. Your work is truly inspiring! Thanks again for sharing your process, Jenny! Love the quilting you did on this quilt. Love it! I hope to get to play with the curved ruler again soon! I love this! I have been pretty strictly a "free-motion" girl since I got my longarm three years ago, but more and more I am using acrylic templates. You just can't beat the "bang for your buck" that they provide, even when used in small doses. Thanks for the inspiration! Would you consider adding a way for us to follow your blog via email, as you have for your other blog? I'd love to be able to follow this blog the same way. Thanks! I really love this design and pattern. Thank you for posting this informational tutorial. I just really love this design. It is so gorgeous! Hi - I have been having a lovely look on your blog. Your work is beautiful and I am inspired by your quilting designs. Appreciate the close-up shots. Thanks for sharing your technique. I'm new to long-arming and have wondered how the circle templates are used. Show us more! Glad you're back blogging and quilting. Beautiful!!! I bought this pattern and am a new longarmer. You just gave me something to shoot for! Thank you.